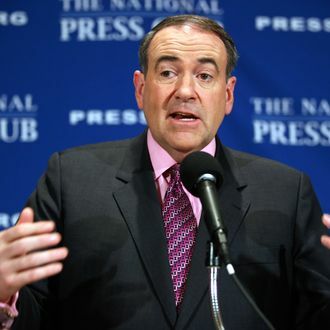 Mike Huckabee sat out of the 2012 race, but he may give it another shot in 2016 – or would at least like us to think that he might. The former Arkansas governor and current talk show host said in an interview Thursday night that he’s getting encouragement to run “from places where I never got it before.” He added that Republicans need to do a better job of reaching out to all voters. “One of our failures is the ability to speak to African-Americans, to speak to Hispanics, to speak to working class people,” he said. “More than just speaking to the board room, speaking to the people who go in and clean up after the meeting.” Okay, just don’t say it like that.